OrbsCorbs: "A Challenge to Assembly Speaker Robin Vos, R-Rochester and Carpetbagging State Rep. Cory Mason, D-Racine: Why The Unsustainable Tax-Payer Funded OPEB Will Lead The City of Racine To Economic Collapse"
"A Challenge to Assembly Speaker Robin Vos, R-Rochester and Carpetbagging State Rep. Cory Mason, D-Racine: Why The Unsustainable Tax-Payer Funded OPEB Will Lead The City of Racine To Economic Collapse"
"WHEE! 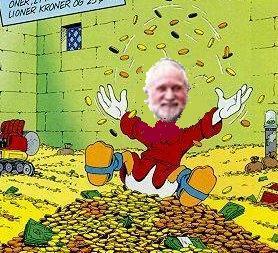 City Administrator Tom Friedel and the rest of the CIty of Racine Public Employees and Officials are IN THE MONEY – for life – courtesy of the Tax-Payers and the unsustainable OPEB they have been promised – 'Other Post Employment Benefits'. It’s all part of the taxpayer provided public employee benefit wonderland where tax-free benefit packages which cost $20,000 to $40,000 plus make up for the low $100,000 salaries…." That which has been promised but can't be paid won't. When does The City of Racine collapse?